The popular fashion jewelry line is expanding via an omni-channel retail strategy. Joseph Nogucci launches new eBay store. 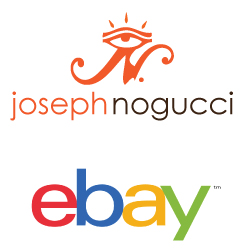 We are thrilled to have Joseph Nogucci launch their branded eBay store with us,” said Kevin Wolfley, Manager, Large Merchant Strategy at eBay.com. With more than 225,000 Facebook fans and a rapidly growing fan base, Joseph Nogucci has become a household name in fashion jewelry and accessories. Now loyal fans and new customers alike can purchase Joseph Nogucci items in the new Joseph Nogucci eBay store. In 2013, Joseph Nogucci was named a Success Story by Facebook for its impressive use of the social media site to drive traffic to their website, market their items, gauge product popularity and increase online sales. Now the company has plans to take its branding to the next level by making its mark on eBay. In June, company co-founder Mario Lavorato was a featured panelist for an education session at the 2014 STORE Retail 360 Conference in Toronto titled, “Creating Opportunity Together: eBay and Omni-Channel Retail.” During the session, Lavorato and fellow panelists Andrea Stairs and Kevin Wolfley of eBay Canada, discussed online integration, sales and omni-channel retail strategies in a global marketplace. To celebrate the launch of the Joseph Nogucci eBay store, their designer semi-precious charm stone bracelets will be 50% off (exclusively for eBay customers) through August 3, 2014. The brand’s full line includes an expansive variety of jewelry designs and specialty housewares. Joseph Nogucci also owns the designs and exclusive rights to Morfologi, a line of 3D printed archi-jewelry, and IRIS, a Murano Bead & Charm brand that focuses on lamp work glass designs and silver and crystal charms. IRIS beads are compatible with Pandora, Chamilia, Persona and more. Founded in 2011, Joseph Nogucci is a design firm based out of Toronto specializing in proprietary designed jewelry. The Nogucci Brand also owns the designs and exclusive rights to both the IRIS brand of beads and charms and Morfologi, a line of 3D printed archi-jewelry. The brand appeals to a young, up and coming demographic with a focus on trend setting design by a team of University of Toronto Architecture graduates. Joseph Nogucci, IRIS and Morfologi represent a design collective dedicated to offering quality, well designed products with an attention to detail, craftsmanship and customer care. A company with heart, Joseph Nogucci has proudly raised funds for numerous social good causes they are personally connected to such as Cystic Fibrosis Canada, the It Gets Better™ Project and the Breast Cancer Foundation of Canada. Visit http://www.josephnogucci.com. To visit the Joseph Nogucci eBay store, go to http://stores.ebay.com/josephnogucci/. Follow Joseph Nogucci on Facebook and Twitter. Founded in 1995 in San Jose, California, eBay Inc. connects millions of buyers and sellers globally on a daily basis through eBay, the world's largest online marketplace, and PayPal, which enables individuals and businesses to securely, easily, and quickly send and receive online payments. We also reach millions through specialized marketplaces such as StubHub, the world's largest ticket marketplace, and eBay Classifieds sites, which together have a presence in more than 1,000 cities around the world. eBay is visited by more than 8 million unique Canadian per month (comScore Media Metrix: November 2013). For press inquiries about eBay, please contact Megan Vickell at 416.934.2028 or via email at mvickell(at)eBay(dot)ca.